This might have been a very different, less grumpy review if I had tried the Explosions d’Emotions collection before learning that L’Artisan was retiring* THREE of my favorite fragrances**. But it’s hard to get too excited about these dramatically overpriced, resolutely three-star perfumes in light of what they’re replacing. Amour Nocturne smells like very burnt cotton candy. The official note list includes cedar, hot milk, caramel, orchid, and gunpowder. I don’t know what gunpowder smells like, because I don’t live in colonial Virginia, but perhaps that’s the source of the burnt effect. Amour Nocturne is an instantly likable fragrance, evoking childhood carnival memories without being sickeningly sweet. Only you can decide if you’re willing to spend $280 to smell like burnt cotton candy. Deliriae smells like non-burnt cotton candy, the wet insides of an apple, and bright, silver metal. This is the strangest and least wearable fragrance of the trio, although anyone intrigued by the idea of a metal note should certainly check it out. The metallic effect is definitely prominent and makes for a rather dissonant fragrance; the first time I tested Deliriae, I thought it smelled like bell peppers. Like Amour Nocturne, Deliriae strikes me as a fun little conceptual piece that might be more at home in a $15 Demeter bottle than a $280 L’Artisan one. The name, the notes (saffron, whiskey, leather), and the rather explicit ad for Skin on Skin all led me to expect a deep, seductive leather scent. Instead, Skin on Skin is a soft, creamy iris fragrance melded with the gentlest of suede notes. When I smell this fragrance, I see the color blue. I find it dreamier and more melancholy than its sensual name would suggest. Skin on Skin is by far the most complex of the three fragrances, and the only one that I would consider to be a proper perfume rather than an interesting smell. Talk to me, L’Artisan. We’ll get through this together. 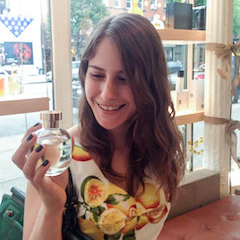 Why do you routinely discontinue your most gorgeous and creative perfumes? Why are you phasing out your 50 ml bottles, forcing us to buy 100 ml bottles that we will never, ever get through? Why do you offer 15 ml bottles for only two fragrances, and only at Sephora? I’m here for you, L’Artisan. Until you discontinue Dzing!, at which point I will stage an intervention. *A sales assistant at Barney’s New York told me last week that L’Artisan is “retiring” Bois Farine and Safran Troublant. When I checked the L’Artisan website for myself, I found that those two fragrances (along with Traversee du Bosphore, Mimosa Pour Moi, Drole de Rose, and several others) had indeed been moved to a new section titled “La Bibliotheque”, the French word for “the library.” My totally-unconfirmed-by-anyone suspicion is that these Bibliotheque fragrances will eventually be online-only. ** Safran Troublant, Bois Farine, and Poivre Piquant. Perfume prices are definitely reaching the AYFKM levels, in general. I don’t get what L’Artisan is up to, at all. It’s just so disappointing to see the price increase on these so drastically when they’ve always been such a reasonably-priced line. All these 3 L’Artisans are no good to me. Too bad they discontinued Safran Troublant. As much as I don’t like the brand AT ALL, ST was my favorite. I think I will be getting a backup. Can’t think of anything much like my beloved ST.
I’ve just checked out the UK website – Dzing is listed under the ‘last chance to buy’ section, alongside Traversee, Mimosa pour Moi, Drole de Rose, Bois Farine, Verte Violette, L’eau de L’artisan, Fleur de Liane, Mandarine, Coeur de Vetiver, and Ananas Fizz. Safran Troublant is not there, however. Okay, that’s it. Dzing! is the last damn straw. INTERVENTION TIME. I don’t get it. It’s also listed in the Bibliotheque section, so who knows what they plan to do with it. I’m hoping it may just be a cynical ploy to get people panic-buying extra bottles and that it may still at least be available online in future. Joanna, as of a few hours ago, the “last chance to buy” section is now on the American website, too, so it is definitely time to panic-buy. Thoroughly enjoyable reviews of all three! I especially loved, “I don’t know what gunpowder smells like, because I don’t live in colonial Virginia…” I actually guffawed. The list of notes was so promising but I don’t think these are for me. The price point really is ridiculous. That’s kind of depressing. It had such great potential! I’ve been cranky about L’Artisan since Tea for Two was discontinued!! Tea for Two and Safran Troublant are some of Olivia Giacobetti’s best work. So sad to see them go. Hmm, do I rush to try a few of these, or ignore the line altogether? Safran Troublant and Traversee de Bosphore have been on my “To Try” list for a while, and Mimosa pour Moi sounds nice, but reports of no staying power are discouraging. I’m already starting to feel a bit jaded, after about nine months down the rabbit hole. Laurels, I may be biased, but I think that the L’Artisan line (for at least a little longer) has some truly great perfumes that are worth going out of the way to try. Mimosa pour Moi is gorgeous, but does indeed have poor lasting power. Traversee is heavy by L’Artisan standards, and less likely to disappoint you on the longevity front. Oh gosh. Thanks for this update Ari, wow, alarming! Well, except maybe for Skin on Skin–I’m glad it’s interesting even if not quite as deep as advertised. I’ll keep it on the to-sniff list. As for the fate of the others (and the price tag for SoS, for that matter), geez. It’s hard to know what to do. I can’t quite justify full bottles of ALL of the ones I’d be very sorry to see gone forever, but it sounds like I might need a Dzing back-up bottle at minimum? That one I’m not going fool around with! Oh yes, best not to risk being without Dzing. That one’s so special. There are about five that I would buy on the spot if the 50 ml were still available. Exactly. So frustrating that the 100ml is the only option… I guess decants are what I’ll end up doing? Not ideal but. Safran Troublant being retired? Shockingly misjudged. I loved your review but was only intrigued by the suede-y iris, and not for the money, sadly. So exciting to see a comment from you, Vanessa! The intent here is clearly to phase out their more challenging scents, but I wouldn’t necessarily think that Safran Troublant would even fall in that category- it seems so easy to love.